A range designed for photographic, medical, dental and veterinarian applications - used also for opticians and other specialist applications. Most darkrooms need a minimum of ten air changes per hour for comfort and efficiency. For rooms containing heat producing equipment (eg: print glazers) a higher rate of air change may be desirable. The Darkroom fitting kit has two cowls, the interior cowl being designed to give light protection. It can be installed in windows, partitions, external walls or roofs. Extended fixing rods for fixing thicknesses up to 370mm are supplied with the unit. Provision should be made for adequate air replacement through Vent-Axia non-vision grilles. With energy savings in mind Darkroom models are supplied complete with an integral instantaneous automatic louvre shutter concealed behind the interior cowl. Operates on intake and extract at any angle of mounting. When used with a T-Series or Ecotronic controller, the shutter can be set open with the fan motor switched Off to provide natural ventilation without the security risk of an open window. A connector Top Socket is standard on all T-Series fans. Allowing fast and trouble-free mains connection. Suitable for running at any angle. Quiet running, enclosed. Fitted with Standard Thermal Overload Protection (S.T.O.P.). Suitable for operation in ambient temperatures from -40°C to +50°C. 5 years product warranty provided on units purchased from the 1st August 2018. Click here for technical information, within our Online Product Selector. After, select your required fan model from the list to display Performance, Sound, Dimensions and Electrical Data. A range designed for photographic, medical, dental and veterinarian applications - used also for opticians and other specialist applications. Most darkrooms need a minimum of ten air changes per hour for comfort and efficiency. For rooms containing heat producing equipment (eg: print glazers) a higher rate of air change may be desirable. The Darkroom model has two cowls, the interior cowl being designed to give light protection. It can be installed in windows, partitions, external walls or roofs. Extended fixing rods for fixing thicknesses up to 370mm are supplied with the unit. Provision should be made for adequate air replacement through Vent-Axia non-vision grilles. For areas requiring total light exclusion, contact your local Vent-Axia Sales Office. Shutter With energy savings in mind TX models are supplied complete with an integral instantaneous automatic louvre shutter concealed behind the interior cowl. Operates on intake and extract at any angle of mounting. The shutter is electronically controlled by an actuator with a damped action giving quiet operation during instant opening and closing. The interlocking edges of the shutter blades provide maximum backdraught protection. When used with a T-Series controller, the shutter can be set open with the fan motor switched Off to provide natural ventilation without the security risk of an open window. TL models do not have a shutter. They are suitable for room to room systems and where there is a need for ventilation of specialised equipment. The TL model will also provide natural ventilation where required when the unit is switched Off. Suitable for operation in ambient temperatures from -40°C to +50°C. For groups of units of any one size up to a total of 400 watts. Do not mix T-Series with Standard Range ventilating units on one controller. 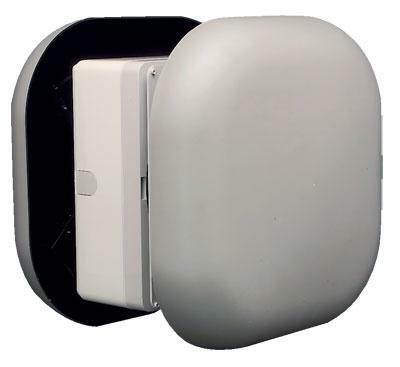 Automatically reacts to the deterioration of air quality, sensing tobacco smoke, smells and toilet odours to regulate mechanically ventilated areas, such as cinemas, pubs, clubs, restaurants, kitchens, toilets and conference rooms. The sensor switches when the air quality declines below an adjustable preset level. This is registered by a self-cleaning ceramic sensing head. The air quality sensor should not be used for the detection of combustible gases. Ambient operating temperature range 0°C to +50°C. MIN - MAX mode or direct Damper control. Dimensions:87 x 157 x 47mm (H xWxD) Surface mounted. 1 - 25 min O/R timer. Supply voltage 24V DC SELV. Humidity Control is automatic and can be set to switch between 65 and 90%RH. An integral pullcord provides a manual override function if required. Can be wired for either ON/OFF or Trickle Boost operation. Set Point adjustable. Maximum switching load 1 amp inductive. Pullcord override indicator Ambient operating temperature 0°C to +40°C. Dimensions:87 x 87 x 33mm (H x W x D). Supply voltage 24V DC SELV. Humidity sensors should be sited approx. 100mm below ceiling level and not above cupboards, refer to siting details in fitting and wiring instructions supplied with product.